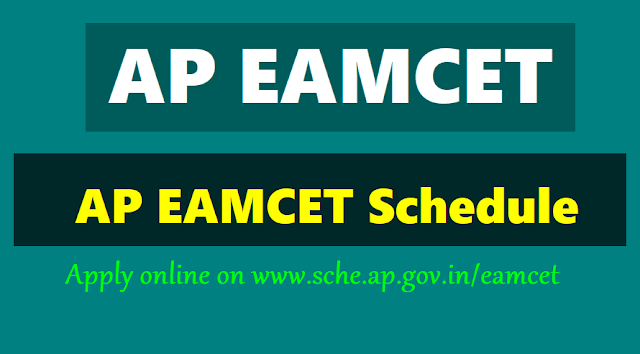 AP EAMCET 2019 Schedule, Apply online on www.sche.ap.gov.in/eamcet. Online #AP #EAMCET 2019 Notification, Schedule, Apply Online on www.apeamcet.org: The Engineering, Agriculture and Medicine common Entrance Test (Eamcet) 2019 in Andhra Pradesh, Minister for HRD Ganta srinivasa Rao announced at JNTU-Kakinada will conduct the test. The AP government decided to conduct EAMCET on its own as its efforts. JNTU Kakinada has published the AP EAMCET 2019 notification and it is being conducted on behalf of APSCHE. Applications are invited form eligible students for entry into the first year of the following courses offered for the academic year 2019-2020 in the state of Adhra Pradesh. A total of 1,65,000 seats are available in the engineering colleges and 1,16,732 of them will be filled up under convener’s quota. More than two lakh students are expected to appear for the test. The minister students from AP, who wish to join some prestigious engineering colleges in Hyderabad, have to appear for the EAMCET by Telangana. The AP EAMCET 2019 exam schedule was announced by Sai Baba at a press conference conducted in Vijayawada. AP EAMCET 2019 exam schedule has been released by the Jawaharlal Nehru Technological University Kakinada. The exams will be conducted online, in the month of April divided into two different shifts. The exam dates were announced by the EAMCET convenor Sai Baba in a formal press conference at Vijayawada. He also announced that the detailed official notification for AP EAMCET 2019 will be released on February 20, 2019, by the APSCHE (Andhra Pradesh State Council of Higher Education). The application forms for the AP EAMCET 2019 will be made available from February 26, 2019. Candidates who meet the eligibility criteria announced by the JNTUK will be able to fill and submit the AP EAMCET 2019 application form till 27th March 2019. The official notification for the AP EAMCET 2019 will be released by the APSCHE on 20th February but the council in association with JNTUK has announced the important dates related to different activities or events that are scheduled to be conducted during the AP EAMCET 2019 exam cycle. Andhra Pradesh Engineering Agriculture and Medical Common Entrance Test (AP EAMCET) is conducted by the JNTUK as an entrance exam or screening test for Engineering and Agricultural aspirants who are seeking admission to undergraduate level programmes. As announced by the council the exam will be a 3 hour long computer based test consisting of MCQ. The exam will be based on three subjects--Physics, Chemistry and Mathematics. 1. Visit the official website sche.ap.gov.in. 1. Candidates applying for the common entrance test must be at least 17 years at the time of applying. 2. Candidates need to clear the 12th board exams with respective subjects. 3. Candidates have to pay 500 Rs. for the application fee. 4. The last date for applying is March 27, 2019. 5. The eligible candidates are advised to go through the official notification before applying for the entrance examination. Visit the websites for further details. The Andhra Pradesh State Council of Higher Education will release the EAMCET notification in the month of February, 2019 . Engineering, Agriculture and Medical Common Entrance Test 2019 (EAMCET 2019) will be conducted (as per G.O. Ms.No. 73 Higher Education EC.2 Dept., Dt: 28-07-2011) by Jawaharlal Nehru Technological University, Kakinada (JNTUK) for entry into the first year of the following Under Graduate Professional courses offered for the academic year 2019-2019 in the University & Private unaided and affiliated Professional colleges in the State of Andhra Pradesh. a) Candidates should be of India Nationality or Persons of Indian Origin (PIO) / Overseas Citizen of India (OCI) Card Holders. 1. Candidates should have passed or appeared for the final year of Intermediate Examination (10+2 pattern) with Mathematics, Physics along with Chemistry / Biotechnology / Biology as optionals or related vocational courses in the fields of Engineering and Technology, conducted by the Board of Intermediate Education, Andhra Pradesh along with bridge course or courses conducted by it for candidates enrolled during 2000-2002 and subsequent batches, or any other examination recognized as equivalent thereto by the Board of Intermediate Education, Andhra Pradesh, provided that candidates who have passed or appeared for the final year of Intermediate Examination (10+2 pattern) with Biology, Physics and Chemistry as optionals along with the bridge course examination in Mathematics conducted by the Board of Intermediate Education, Andhra Pradesh shall also be eligible for the Bio-Technology course. 2. Candidate should obtain at least 45% of marks (40% in case of candidates belonging to reserved category) in the subjects specified taken together at 10+2 pattern. 3. In the case of Engineering and Pharmacy courses, candidates should have completed 16 years of age, as on 31st December of the year of admission. There is no upper age limit. 4. In the case of B.Tech (Dairy Technology), B.Tech. (Ag. Engineering), B.Tech. (FST) and B.Sc. (CA & BM), Candidates should have completed 17 years of age as on 31st December of the year of admission and an upper age limit of 22 years for all the candidates and 25 years in respect of Scheduled Caste and Scheduled Tribe candidates as on 31st December of the year of Admissions. B.F.Sc. (i) Physical Sciences; (ii) Biological or Natural Sciences; (iii) Vocational Course in Fishery Sciences. Note: (1) Irrespective of the subjects taken at the qualifying examination, candidates seeking admission to the above courses should appear for Biology, Physics and Chemistry in EAMCET. (2) Candidates should have completed 17 years of age as on 31st December of the year of admission and an upper age limit of 22 years for all the candidates and 25 years in respect of scheduled caste and scheduled tribe candidates as on 31st December of the year of Admissions. 1. Candidates should have passed or appeared for the final year of the Intermediate Examination (10+2 pattern) or equivalent examination with Physics, Chemistry, Biology (Botany and Zoology) / Biotechnology and English individually and must have obtained 50% marks taken together in Physics, Chemistry, Biology (Botany and Zoology) / Biotechnology at the qualifying examination. In respect of candidates belonging to Scheduled Caste and Schedule Tribe & Backward Classes, the marks obtained shall be a minimum of 40% marks taken together in Physics, Chemistry, Biology (Botany and Zoology) / Biotechnology. 2. Candidates should have completed 17 years of age as on 31st December of the year of admission. 1. Candidates should have passed or appeared for the final year of the Intermediate Examination (10+2 pattern) or equivalent examination with Physics, Chemistry, Botany and Zoology as optional which shall include a practical test in each subject. 2. a) Candidates should have completed 17 years of age as on 31st December of the year of admission. b) There is no maximum age limit for admission into BAMS/BHMS/BNYS. 1. Candidates should have passed or appeared for the final year of the Intermediate Examination (10+2 pattern) with Physics, Chemistry and Biology optionals, conducted by the Board of Intermediate Education, Andhra Pradesh or any other examination recognized by the University as equivalent thereto. 2. Candidate should obtain at least 45% marks (40% in case of candidate belonging to reserved category) in the subjects specified taken together in the qualifying examination. 3. Candidates should have completed 16 years of Age by the date of commencement of Admissions or on such other date as may be notified by the CET Committee. There is no upper age limit. 1. Candidates should have passed or appeared for the final year of Intermediate examination (10+2 pattern) with Physics, Chemistry and Mathematics or Biology optionals conducted by the Board of Intermediate Education, Andhra Pradesh or any other examination recognized by the Board of Intermediate Education, Andhra Pradesh as equivalent thereto or should have passed or appeared at the final year of the Diploma examination in Pharmacy course conducted by the Andhra Pradesh State Board of Technical Education and Training or any other examination recognized as equivalent thereto by the Andhra Pradesh State Board of Technical Education and Training. 3. Candidate should have completed 17 years of age as on 31st December of the year of admission to the course. 3. Proof of satisfying the marks criteria in respect of candidates who appeared for the Qualifying examination during the year should be furnished within 7 days after publication of the examination results by the concerned examination Board. 4. Criteria for Ranking: The candidates who have secured qualifying marks in EAMCET and candidates belonging to the category of Scheduled Caste and Schedule Tribe, for whom qualifying marks have not been prescribed, shall be assigned ranking in the order of merit on the basis of combined score obtained by giving 75% weightage to the marks secured in EAMCET and 25% weightage to the marks secured in the relevant group subjects namely Mathematics or Biology, Physics, Chemistry of the qualifying examination. 5. Submission of the Online Application form for Engineering (E) and Agriculture & Medicine (AM) streams: Candidates with Mathematics, Physics, Chemistry / Bio-Tech. / Biology as optional subjects in their Intermediate or its equivalent course should submit “E” stream online application for Engineering B.E./ B.Tech. / B.Tech. (Ag. Engg.) / B.Tech. (Dairy Technology) / B.Tech. (FST) / B.Sc. (CA & BM) (MPC) / B.Pharm. (MPC) / Pharm-D (MPC) courses. Candidates with Biology, Physics and Chemistry as optional subjects in their Intermediate or its equivalent course should submit “AM” stream online application for B.Sc. (Ag.) / B.Sc. (Hort.) / B.V.Sc. & AH / B.F.Sc. / B.Tech. (FST) / B.Sc. (CA&BM) / MBBS / BDS / BAMS / BHMS / BNYS / B.Pharm. / B.Tech. (Bio-Technology) (Bi.P.C.) / Pharm-D (Bi.P.C) courses. For B.Tech. (Bio-Technology) (Bi.P.C), candidates shall pass / appear for Bridge Course exam in Mathematics conducted by B.I.E, A.P. as per G.O. 17, Dt. 2-2-08.